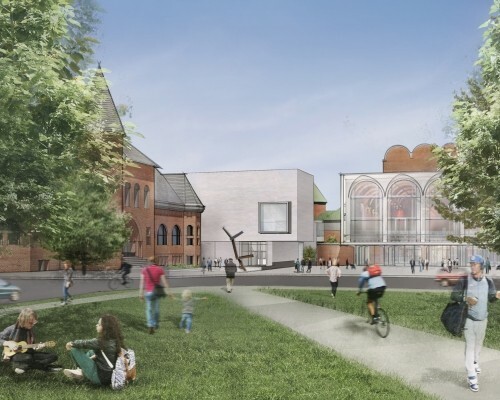 Recently released renderings of a reworking of the Charles Moore-designed Hood Museum in New Hampshire have caused a backlash from fans of the Postmodern architect and author, according to The New York Times. Ironically the team presenting a new version of the structure, Billie Tsien and Tod Williams, protested when they discovered the Folk Art Museum they designed in Manhattan was being demolished by MoMA to make room for an expansion. The Tsien-Williams plan would convert the open courtyard into a covered concourse, which they contend would both renovate the structure and add 40 percent more gallery space to the building, while keeping much of Moore’s design intact. Critics argue that covering up Charles Moore’s ceremonial entrance, one of the eclectic courtyards that became a signature stylistic touch, ruins the “connective tissue” of the museum—which links the 19th-century, brick-clad Wilson Hall and the Hopkins Center for the Performing Arts from 1962—as well as the overall structure. Charles Moore Foundation director Kevin Keim told The Times that the renovation wrecks the entire original conception of the building, and that “Charles Moore deserves far better than this aggressive, ill-designed, shallowly considered project.” Others, including Roger A.M. Stern, also expressed their dissatisfaction with the proposal. Completion of the $50 million renovation project is due in 2019. The galleries are now closed for deinstallation, with excavation, construction, and reinstallation likely to continue through 2018. Although the Hood has served students well for three decades, visibly it has kept a low profile—to the point that visitors to the museum sometimes struggle to find it. The reimagined Hood will make a bolder statement about the significance of the arts within the life of Dartmouth. Coupled with planned renovations to the Hopkins Center for the Arts, the expanded Hood will provide the Arts & Innovation District with an arresting new front door to the world. The Hood will proudly proclaim its presence and encourage more students and visitors than ever to come inside and explore the museum’s collections. The Hood will also become a robust center of creativity: a place for students to gather, discuss the arts, explore the intersection of the arts with other disciplines, and collaborate on projects that can only be imagined today. The bolder character of the reimagined Hood begins at its entrance. The firm Tod Williams Billie Tsien Architects|Partners has proposed a striking entrance, visible from the Green and Wheelock Street, that invites exploration. Approaching the new main entrance, students and guests will pass through the North Plaza, sure to be a natural meeting place as it will welcome those arriving at the Hood from any direction on campus. The North Plaza will invite conversations and impromptu performances on its many gentle steps and supply an inspirational setting for sculpture and other installations. Entering the Hood, students, faculty, and guests will find themselves in the Museum Atrium, one of the signature spaces in the expanded Hood. This will be a gateway that proclaims the centrality of the arts. The Atrium will also provide a space for commissioned works of art and a flexible venue for events, including dinners and performances for upwards of 100 guests. curricular demand for the direct study of original works. into the creation, context, and meaning of individual works. 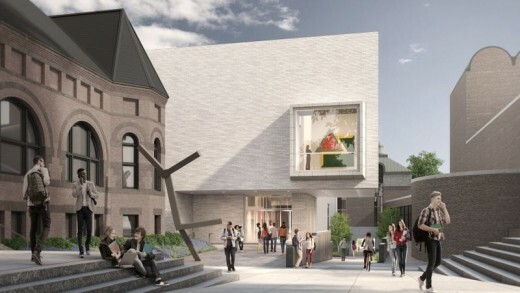 The Hood expansion will add five new galleries, designed to showcase the museum’s extensive collections and encourage interdisciplinary teaching through objects from the collections. These spaces will accommodate the display of art from different cultural and historic periods in a variety of media. 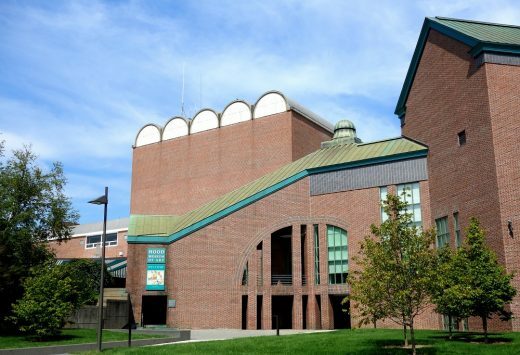 Planned in concert with the curricular needs of Dartmouth and the interest of the community, the galleries will feature frequent rotations of objects to fully capitalize upon the richness of the collections and present new and engaging experiences for repeat visitors. In all, the Hood boasts one of the largest and finest university collections in the country. As contemporary artists continue to push the boundaries of painting, photography, sculpture, video, installation art, and other genres, the new galleries will provide the space to showcase, not just the present and past, but the very future of art.